A band of crusading knights is charged with escorting the Holy Grail to safety through a plague-ridden countryside. Hunted by assassins, the knights venture into the forbidden Valley of Black Death where they discover something even more terrifying than the plague and the ruthless killers hot on their trail. The banned valley has become home to the undead. Overrun by hordes of flesh-eating zombies, their only chance for survival is a mysterious maiden who can guide them out. Captured international assassins are locked up inside a high-tech bunker known as the Killing Chamber and to break out they must kill 'em all! The cast includes Johnny Messner, Chia Hui Liu, Joe Lewis, Tim Man, Ammara Siripong, Brahim Achabbakhe, and Erik Markus Schuetz. Based on a true period in Chinese history, Leon Lai plays 'Liu Bang,' with Feng Shaofeng as 'Xiang Yu,' the legendary warrior brothers in Director Daniel Lee's medieval war epic. 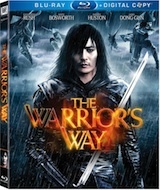 The film features a star-studded cast in the story of two brothers contending for success and power during the fall of the Qin Dynasty. The stakes are high. And so is the body count. This is non-stop high intensity where a double cross is as simple as ink on paper. Boasting an incredible cast including Oscar-winning actor Cuba Gooding Jr., Dolph Lundgren and Claudia Bassols. The story of two rival Olympic marathon runners who fight for Japan at the start of World War II. Captured by the Soviets and Germans, they eventually escape and meet on the beaches of Normandy in 1944. Bonus features include a new optional English language dub and behind-the-scenes interviews and footage from the making of the film. Three female assassins have 24 hours to complete their mind bending mission in the City of Angels.